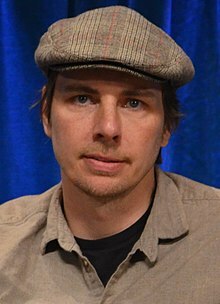 Highland Township, Oakland County, Michigan, U.S.
Dax Randall Shepard (born January 2, 1975) is an American actor, writer and director. He is also known for his role as Tom Marshall in Without a Paddle. Shepard started dating actress Kristen Bell in 2007. Their daughter, Lincoln Bell Shepard, was born on March 28, 2013. Dax and Bell married on October 17, 2013. Their second daughter, Delta Bell Shepard, was born on December 19, 2014. Their third child and first son, Simon Kenneth Shepard, was born on January 24, 2018. ↑ Ravitz, Justin (17 October 2013). "Kristen Bell, Dax Shepard Get Married in "No Frills" Wedding at County Clerk's Office". Us Weekly. Retrieved 19 October 2013. ↑ "Dax Shepard and Kristen Bell Welcome Daughter Delta". People. 19 December 2014. Retrieved 19 December 2014. ↑ Justin Kroll (September 9, 2016). "Dax Shepard to Co-Direct 'Scooby-Doo' Animated Film With Tony Cervone". Variety. Retrieved June 9, 2018. This page was last changed on 24 December 2018, at 00:10.